Mozfest (short for the Mozilla Festival) is an “unconference” which is run every year in London by Mozilla. This year many of us went along and ran sessions on a range of topics. The simple cardboard box was certainly my first encounter with a hackable object; as a small child I, like many others, would probably spend more time playing with the packaging of a new toy than the toy itself. The box holds the potential to become whatever you want, from a spaceship to take you to a distant planet, to a character to help in the battle against your sibling! By being given a pen, pair of scissors and a roll of tape, the individual becomes empowered to manipulate their own environment to better suit their needs. 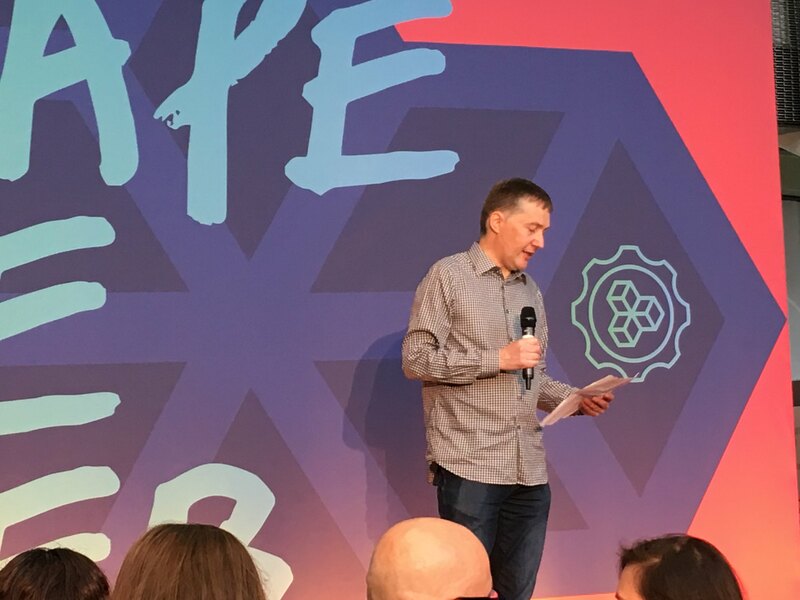 It is this ownership of a space that the Mozilla festival represents to me – a community set up to empower people to use the web as a power for good and to fulfill their own individual needs. The whole of the Global Village, floor 6 of the festival, was set up using boxes to represent different rooms: a garage, a kitchen, a library and a garden. The garden was put together to be a space for quiet reflection and playfulness; a space where ideas could grow. On the Friday, our cardboard boxes became a shed, trees, flowers, bird houses and even a compost bin. Real leaves and sticks reconnected the space to nature and a record player added musical ambiance. A non-cardboard weather station was displayed, but it didn’t record the small drip of condensation from the ceiling on Saturday as rainfall! Throughout the weekend, people of all ages came to the garden to take part in sessions and also to take some time out from fast-paced nature of the festival. Sessions included using data to influence lighting, discussions around open sharing of data and ideas, ways in which to protect individuals from exploitation and to create an online environment where people with ideas could meet people with ways to make those ideas happen, and ways to capture visual thoughts. Informal gatherings happened around the tables where people worked further on projects from elsewhere in the festival. We asked people to create an emoji from air drying polymer clay to represent their experience of Mozfest, in the future we’re hoping to use these to make a Rosetta stone of the digital age and explore language and culture. Children, media students, educators, parents, technology enthusiasts, artists and industry experts all collaborated in the space and several groups exchanged contact details to take the concepts developed in the one hour sessions further in the future. I am particularly looking forward to seeing the online idea sharing platform become “a place on the web to benefit humanity”! Unsurprisingly we have vast amounts of weather data at the Met Office. Much of this data is in the public domain as part of the UK government open data strategy. The Met Office spends a lot of time turning that raw data into information which is useful for people. Ranging from whether you want to know if you need to take an umbrella to work, to knowing which way to point your wind turbine for maximum renewable energy production. However much of the information that can be gleaned from weather data requires at least one other data source for it to be truly useful. That could be something as simple as the location and height of your wind turbine, or as complicated as the previous 5 years of supermarket sales to find trends between purchases and the weather to inform stock ordering. My session was designed to make attendees realise that no matter how much data and information your organisation generates you can do far more interesting things when you start sharing your data with others. We fell back to plan B which was to split into groups and generate as many ideas as possible for information which could be produced from mixing multiple data sets. Some of the most interesting ideas included; expanding on my previous example to forecast surges in the tube network and then dynamically adjust the pricing scheme to encourage passengers to travel earlier/later; combine weather, climate, flooding, events, house pricing, broadband availability and much more to advise on house purchases or even whether you should wear white trousers based on the weather and if you’re taking public transport. This was another ‘low-tech’ session discussing openness in innovation. We quickly explored how modern business models for Open Innovation and the growth of hackathons and communities of makers were changing the way new ideas emerged and developed. Two topics of interest developed from this group, so we split into two “teams” explore these. Improving idea gathering web sites. There are public sites, and most large businesses operate internal systems. For some innovators being publicly associated with an idea and seeing their ideas judged so publicly is clearly threatening to esteem and is likely preventing innovators coming forward. Could we fix this? Whether, or how, to engage with big business in the design and delivery of hackathons, open source projects, and other open/maker community initiatives. Moving from initial concern about protecting intellectual property, we discussed perceptions and motivations of the various participants, particularly of community leaders and those offering sponsorship. This session was aimed at anyone interested in learning about WebGL. While we did make some reference to our own projects, the focus was really on getting people to understand the general concepts and start playing with WebGL shaders. WebGL is used to create efficient and customisable 3D graphics inside the web browser. There are excellent libraries available to make this process easier, with threejs being a notable example. However, there may be times when you need to dive a little deeper. Writing your own shaders gives you far more flexibility to decide the appearance of your objects. After describing how we used WebGL for our own project, giving the appearance of volumetric clouds by using ray marching, we broke off to let people start working. The group was split around 50/50 between people working on coding exercises and others who discussed how they might use the technology. We also had demos from Michael and Jacob, showing Mike’s new WebGL globe and our Google Cardboard example. The aim of this session was to explore the notion that requirements for expert knowledge in participation and engagement with complex issues can be reduced hugely through encouragement to share and create rather than debate. In this ‘low-tech’ session no wi-fi or laptops were required. We gathered together under the Banyan where Helen shared images of recent projects in which she has used fashion to explore human connections with science. We then explored Helen’s latest project Dress for our time which uses fashion, and the ‘surface of us’ to present information about climate change and, in the coming months, other data about our relationship with our changing world. We enjoyed Indian coffee and snacks and discussed the project, its aims, and the benefits of indirect approaches to controversial or shocking material - “no one is afraid of a frock” (H Storey). Members of the group introduced themselves and asked questions spanning from “why a dress?” to those about the choice of data and technology being used to present information and intended audiences. The session closed by drawing on disposable decorators overalls, with, of course, messages and questions about climate change. Not only were the sessions well structured and informative at Mozfest 2015, but the general vibe and enthusiasm from other creatives left me feeling hugely inspired. I also learnt the basics of how the Fly Through Weather application was built – which is always a plus for someone working on the design. The staff were great too! Help was on hand whenever needed and with a constant supply of instant coffee, my lust for caffeine was always met. Roll on Mozfest 2016!